As I start to think about how to decorate my classroom for the upcoming school year, I am reflecting on last year's classroom design. What was useful? What was cute but ended up being a waste of time? Today I want to share the top ten classroom decorations that my students actually used and referenced on a regular basis. In a sense, these are classroom must-haves. 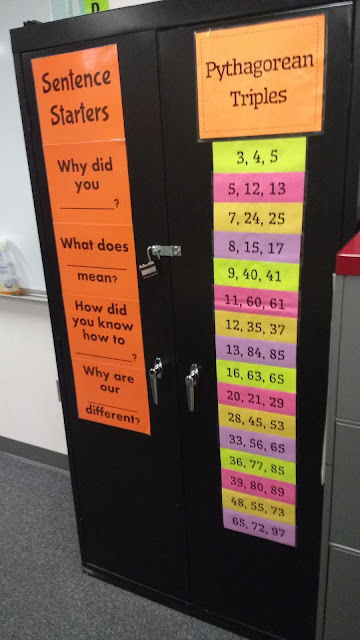 These are the decorations that made my students started complaining when I took them down during the last week of school! Math Symbols Posters - The most referenced symbols on these posters are greater than, greater than or equal to, less than, and less than or equal to. 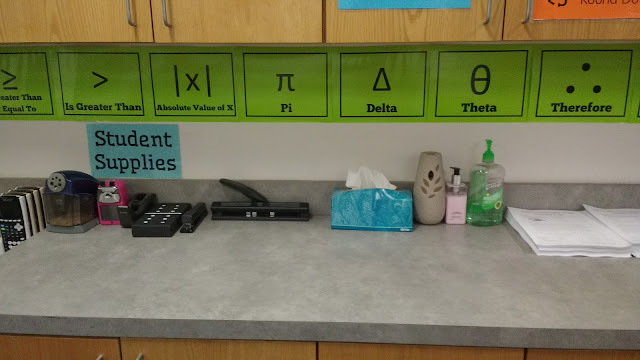 My students know that these are always on the wall to reference whenever they aren't quite sure what symbol they are dealing with. I actually made more of these posters than will fit on my wall. So, I choose which ones to hang up each year based on which classes I am teaching. You can download the file for these posters here. Prime Number Banner - My students are frequently asking if a certain number is prime. So, a few years ago I made a prime number banner that goes from 2 to 107. We use this all the time. I even find myself using it! 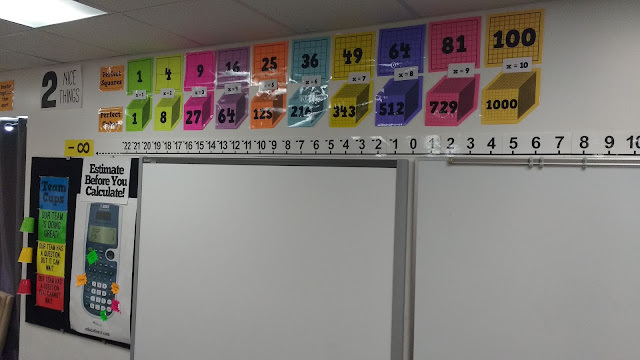 My students have a prime number chart in their notebooks, but it's often quicker for them to just glance at the wall. This poster gets used an extra amount when we are working through our unit on radicals! You can download the file for this prime number banner here. Horizontal and Vertical Number Lines - I love number lines. And, my students really love number lines. I actually have three number line posters hanging up in my room. 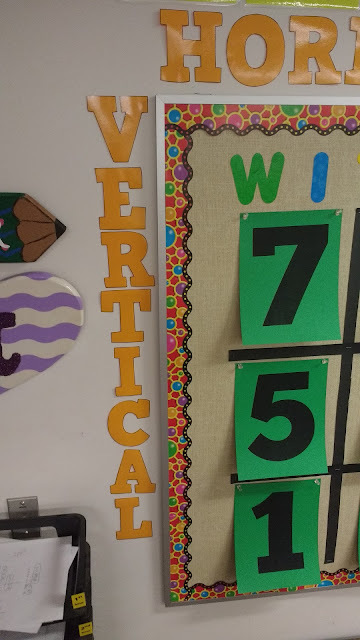 I have two vertical number lines that are hung on opposite walls. I created the file for this number line myself, and I blogged about it here. My horizontal number line gets the most use from students. I frequently see them with their pencils in the air as they count off spaces on the number line. 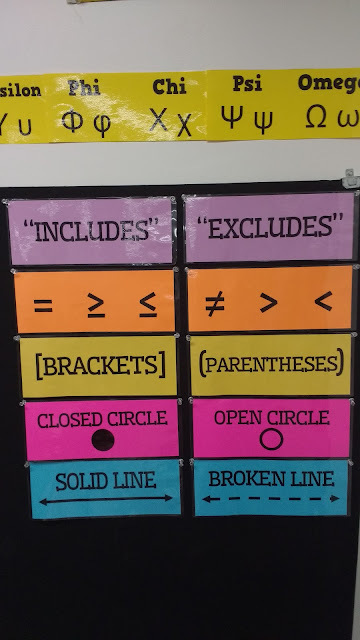 This number line was printed from a PDF file created by Frank Tapson. I blogged about the process of making it (and linked to the file) here. 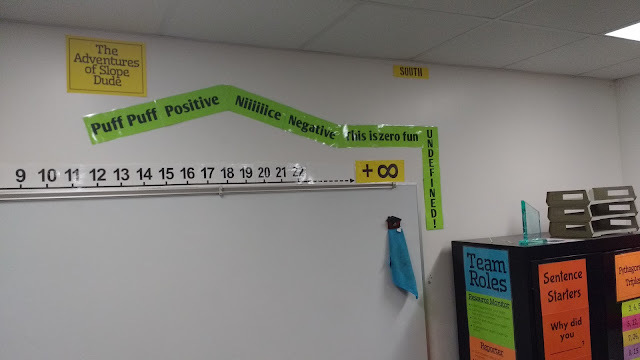 This past year, I added positive and negative infinity signs for the first time. You can find out more about those here. Perfect Squares and Cubes - These posters were inspired by Clarissa Grandi. Clarissa used pre-cut numbers to make hers, but I didn't have the patience to track any of that down. So I ended up just creating my own version in Publisher so I could type the numbers on top. I love the color that these add to my classroom. My only complaint is that my students often needed to see if a number much higher than 100 was a perfect square. So, I need to think about how to fix this for next year! Files can be downloaded from this blog post. Order of Operations - Even though my high school students have been learning about the order of operations since elementary school, I find that they still need a reminder. They are also used to pretty much only seeing problems involving parentheses. So, the fact that we actually do all grouping symbols which include crazy things like absolute value bars, radicals, and vinculums seems crazy to them. This display tries to help with that. You can download the files here. 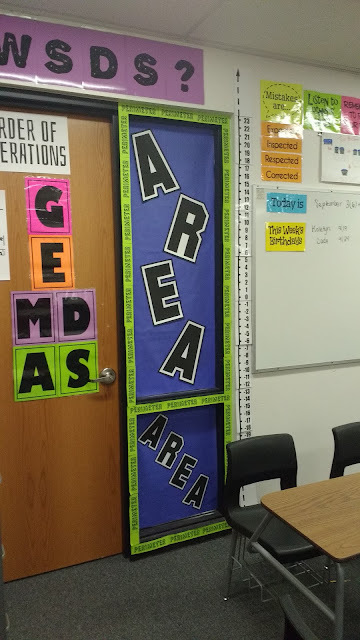 Horizontal/Vertical Lettering - There is something about the words horizontal and vertical that tricks up my students every year. 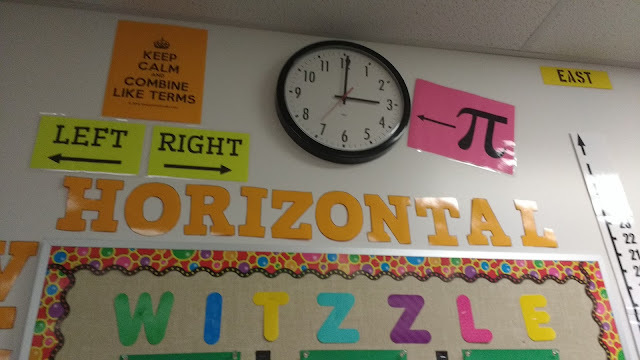 I've found that the best way to deal with this is to put the words up on the wall with the proper orientation. I could have used pre-cut lettering for this, but I decided to just pick a fun font and print out the letters. You can find the file I created to make these here. 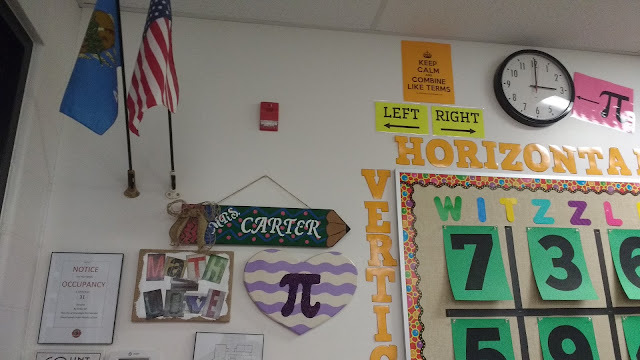 Left/Right Reminders - Some of my students also struggle with left versus right. So I hang up a reminder on the wall every year so it's there for them if they need it. Download here. 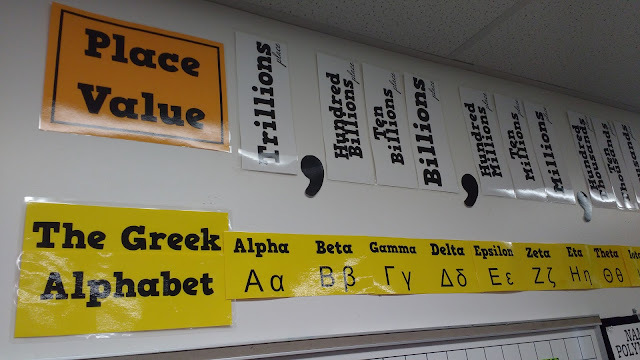 Greek Alphabet and Place Value Posters - I'm not sure what it is, but my students are intensely curious about the Greek Alphabet. I put this poster up every time I teach trig since we deal with theta so much. It's also great for showing students where the delta symbol in the slope formula comes from in Algebra 1. I frequently find students just studying the letters randomly. They love to try and pronounce the names of the different letters. You can find the file to make this for your own classroom here. 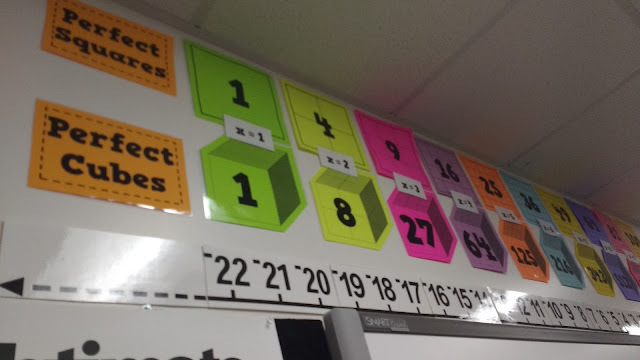 Some of my students have trouble reading numbers aloud, so the place value posters help with that. I even find myself referencing it sometimes! Download here. Includes vs. Excludes Reminder Posters - I made these posters to assist my students with graphing inequalities in Algebra 1. My students didn't reference them much at all when we were working on one-variable inequalities. But, they used them ALL. THE. TIME. when we were working with two-variable inequalities. I had a student retaking a quiz on two-variable inequalities during the last week of school. I had already taken these posters down, and the student made sure to let me know how displeased she was with my actions! Download them here. Four Types of Slope (Adventures of Slope Dude) - I adore teaching my ninth graders about slope every year. I also adore Slope Dude! I made this poster as a fun reminder of the video and a visual reminder of the four types of slope. You can download the file here. Pythagorean Triples - I taught a trigonometry class this past year. We often found ourselves in the scenario where we needed to do the pythagorean theorem to find a missing side. It was nice to be able to check the triples and see if we could find the answer without actually having to do the pythagorean theorem. You can download these here. 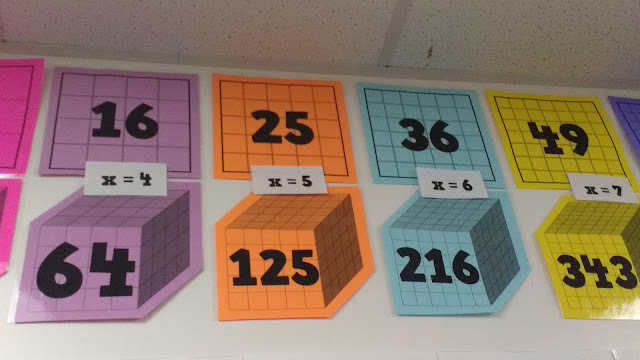 I look forward to incorporating even more math into my classroom decorations in the future! Hey Sarah, Can you share the files for your area and perimeter signs? Love those! 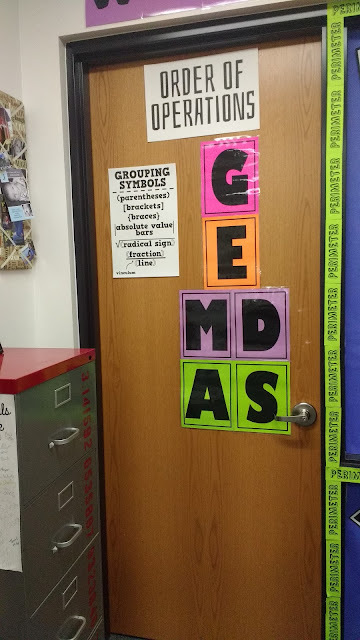 I also really like GEMDAS signs. Thanks for sharing! Can you direct me to your search bar? I don't see it on the blog any more. 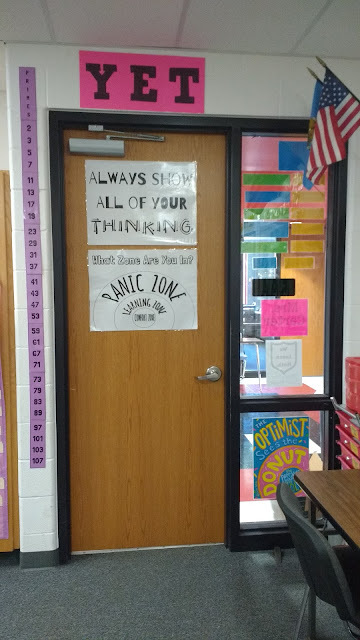 Awesome classroom posters! Thanks for sharing your ideas - love them! Thank you so much for sharing! As a new teacher I will benefit from these awesome (and free!) classroom resources. I love them. You're welcome! Hope you're having fun teaching! Hi! I love your posts and energy and posters...but I can't seem to download any of the files that you have on your different blogs posts. Am I missing something? Thanks so much for sharing your ideas! Love your blog and I've just downloaded several of your posters. Planning a re-do of my room this year. One question: Do you leave all the posters up during quizzes/tests, or do you ask the students to memorize them? Typically I've expected my students to know all of these things, but I do like the visual reminder for while they're still learning, before they're expected to have mastered. Any thoughts? I leave everything up. I find that if they reference a poster enough they start to internalize it. Thank you for sharing this! This is great! Your classroom is very nice.I am from Romania. You give me great ideas. I download the mistake poster.Thank you for sharing !Good luck at school!